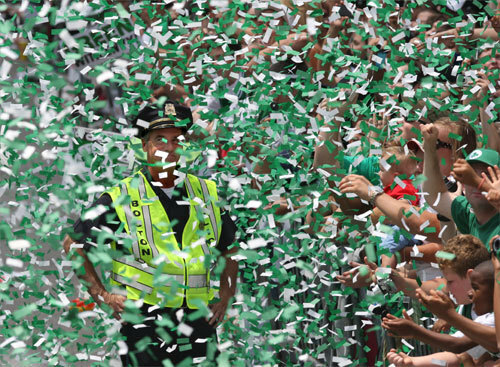 The Boston Globe ran a beautiful special section on the Boston Celtics championship rolling rally today. Here’s a Stan Grossfeld pic that was particularly nice. I expected to find a special championship section in the Boston Globe today. The Globe did have one yesterday. But it has become customary in this era of championships for the paper to have a special section on the day of the Rolling Rally as well. Today’s coverage was divided between the A, City Region and Sports sections. On the website, the stories are unified. I don’t know whether the lack of a special section is a reflection on the advertising market, which it could be, or on the public’s interest in this victory. It will be interesting to watch the turn out for today’s event. I’m anticipating a very young crowd for reasons not limited to the end of the school year. I’m also interested in the sale of merchandise. Even in the down years, the Celtics did a good job of keeping the die-hards involved. The questions are how many newer fans will this terrific team bring into the fold for the future and how many old fans have come back. As I wrote on Tuesday when I spotted Wyc Grousbeck at Pace, the win of the downtown-based Celtics is great for civic pride. I congratulate them on an amazing turn around. John McCain did his best Bob Dole impression tonight. He had the war hero thing down cold, but his comments lacked Dole’s bite. Finally, I must say I adore Obama and his wife as a couple. They have held it together during a very stressful time. The Boston Globe chose to focus on Roslindale as a prism through which to view the economic downturn. It’s a bit of an unusual choice, considering Roslindale’s not being particularly hard hit by mortgage foreclosures as are some communities on the 495 ring or in Southern New Hampshire, where I spent much time last fall. But the neighborhood is a vital, but often unnoticed, part of city life. I suppose the choice to center on Roslindale makes more sense with the recognition that several major executives at The Boston Globe, including Al Larkin and Brian McGrory, grew up in Roslindale. Stephanie Ebbert, who’s been reporting on Boston since she came to the Globe from Pennsylvania some eight years ago, certainly nailed one major attribute of Roslindale Square, the food. “The village is a food lover’s paradise, with ethnic markets, inviting restaurants, and a belt-straining six bakeries. Here, you can find burritos, baklava, bibimbop, pizza, paella, and pho. Casually chic restaurants mingle with unadorned postwar markets whose owners seem to see no need for upgrades. “The storefronts of Greek markets dangle candles ribboned and bedecked with toys for Orthodox Easter, while the broad window at Fornax Bread Co., maker of artisanal breads, is draped with artfully mismatched aprons. But overall I felt this take out had an arbitrary feel. For example, she makes a big deal out of the fact that Bob’s Pita Bakery has admittedly disappointedly stopped baking its own bread. (In fact, with the departure of the Near East Bakery on Washington Street in West Roxbury, there’s no place to get freshly baked pita, where previously there were two bakeries nearby.) But she neglects one of the most welcome recent additions to Roslindale Village, the Boston Cheese Cellar. Of course, a write-up of such a high end, sophisticated food shop, which has experienced an uptick of growth this year in the face of tough economic times, would have directly contradicted the “neighborhood in crisis” notion being promulgated in Ebbert’s piece. When I drove through the Village last night, the neighborhood was buzzing with couples and families walking to dine at one of the many fine local restaurants. Perhaps I’m too sensitive on this. I’m a neighborhood property owner as well as a new member of the Main Streets board. It’s great that the world has finally noticed what we have here. It’s too bad it’s taken a downturn to get them to take note. My initial reaction to the news that Steve Bailey is leaving the Boston Globe is profound sadness. Bailey leaves the Boston Globe and takes his juice with him. As recently as last Friday, when Bailey broke news of Mayor Menino’s speech to the Boston Municipal Research Bureau, he demonstrated his ability to be Morrissey Boulevard’s number one repository of scoops, inside information and insight. I can’t fault Bailey and his charmnig French wife for wanting to move to Europe and taking a fascinating opportunity with Bloomberg. But I sympathize with Globe readers as well as those press secretaries, communications directors and overall big shots for whom Bailey was the first call. Along with the changes comes a promotion for Ellen Clegg, who will essentially fill Helen Donovan’s old slot from what I can tell.Clegg is one of the very tiny group — smaller than a handful — of individuals who ever gave me a shot in journalism: She let me get Boston Globe clips as the stringer from Harvard. I wish her the best of luck in her new role. UPDATE: I’m now told that Clegg takes Michael Larkin’s position, and Caleb Solomon will fill the Helen Donovan slot. Boston Globe Editor Martin Baron announced the best news to come out of Morrissey Blvd. in decades. The Globe has named two new Metro columnists: they are Kevin Cullen and Yvonne Abraham. While Cullen made an international name for himself with his coverage of Europe, in general, and Northern Ireland, specifically, during much of the 1990s and early 2000s, I have always viewed this gritty former Boston Herald crime reporter as a logical successor to Mike Barnicle. With taking nothing away from Brian McGrory who made the Metro slot his own and, as Metro editor, undoubtedly played a role in the selections today, Cullen has an ear for the city which should make for some classic columns. And Yvonne. What can I say other than I expect her to combine expertly the witty attitude of Maureen Dowd with the passion for justice of Eileen McNamara. She’s been a great reporter for the Globe. She will be a better columnist. These are two more reasons to make the Metro page (what I still call City/Region) a must read. Dan Kennedy, a true expert of the local media, posts with his perspective here.